The resolution, first introduced late in last year’s session, would add a new section on state government integrity to the state constitution and would consolidate two agencies that are currently charged with monitoring and tackling corruption -- the Joint Commission on Public Ethics (JCOPE) and the Legislative Ethics Commission -- into a new New York State Commission on Government Integrity. The effort is aimed at dealing with a long-standing problem in New York state government that recently saw the leaders of both houses of the Legislature convicted of public corruption, along with many other legislators who were removed from or left office due to ethical issues over the course of decades. “We think this is the way to create a truly independent ethics body,” Assemblymember Carroll said in a phone interview on Tuesday, shortly after a rally outside the State Senate chambers alongside Senator Krueger and a cohort of government reform advocates. One of the central criticisms of JCOPE, which was created in 2011, is that it is too closely tied to the governor and legislators to be effective, making it a limited deterrent and a weak enforcer. The proposed resolution would have to be passed by the current Legislature and again by the next elected Legislature in the 2021-2022 session, after which it would be presented to voters as a ballot question for their approval. If successful during this session and in 2021, Carroll estimated that the new law could go into effect by January 2022. It would create the new nine-member commission -- five of whom would be appointed by the judiciary; two appointments jointly by the governor, comptroller, and attorney general; and two by legislative conference leaders whose parties are the top-two voter getters in a previous gubernatorial election. The commission would be empowered to issue civil sanctions and censures against legislators, would be able to suspend, demote, or terminate a non-elected employee, and make referrals for criminal prosecution. It would also serve as an independent counsel to legislators and state employees seeking informal ethics advice that can later be used in their defense. Those who have served as political party officials, state employees or lobbyists within the previous three years would be barred from being appointed. Though the proposal does not require Governor Andrew Cuomo’s support, Carroll hoped that it would receive it nonetheless. “I hope the governor sees this is a major ingredient in reforming our broken political system in Albany,” he said. During the only general election debate against his Republican opponent Marc Molinaro, Cuomo had signalled support for reforming JCOPE. “Change begins with the thin edge of a wedge,” Cuomo said, using a phrase he has often employed, in this case to indicate that he was pleased to accomplish something on ethics reform, and can then use it to do more. Both Carroll and Krueger, Democrats like Cuomo, argue that a constitutional amendment is essential, particularly with renewed attention in this last election cycle to the activities of JCOPE, headed by Seth Agata, a former Cuomo aide nominated by the governor and appointed as executive director by the agency's commissioners in similar fashion to his predecessors. The state agency, which monitors lobbying at the state level besides ethics violations, has been widely criticized as inefficient and overly vulnerable to political interference, while at the same time being entirely opaque to the public and lacking clear jurisdiction. In particular, Krueger said the agency has failed to investigate incidents and allegations of sexual harassment, even when they are made widely known. For instance, in January 2018, then-State Senator and Independent Democratic Conference leader Jeff Klein was accused of forcible kissing a former staffer, Erica Vladimer, but JCOPE has yet to make clear whether it is investigating the claim and has not provided any information to either the public, press, or Vladimer in the year since since she spoke out. JCOPE officials have pushed back against such criticism, noting that divulging information about investigations is against the law. At a March 2018 meeting, Commission Chair Michael Rozen said the agency's silence does not indicate action or inaction. "No conclusions should be inferred by the Commission’s silence," he said. The new agency, on the other hand, would have to establish a dedicated unit for sexual harassment investigations and would also have more expansive transparency provisions, being subject to the same Freedom of Information Law that currently applies to the executive branch (there are ongoing negotiations about extending FOIL to the Legislature). Last year, JCOPE’s lack of transparency was put to the legal test. New York Republican party chair Ed Cox and Molinaro, the Republican gubernatorial nominee, sued the agency to force a vote on an investigation into Joe Percoco, the former top Cuomo aide who was convicted on federal corruption charges last year. During the trial, Percoco was found to have improperly used his executive chamber office while working on Cuomo’s campaign, but he was never investigated by JCOPE. On December 19, a state supreme court judge ruled that the agency must take a vote within 30 days and then inform the judge, though they were not ordered to release the details of the vote to the public. “I don’t think that current model is working and I think we need to fix that...It’s just not designed to do its job,” Krueger said of JCOPE in a December interview. She and Carroll were joined at the state Capitol building on Tuesday by representatives of groups including Common Cause New York, Reinvent Albany, the League of Women Voters of the State of New York, the New York Public Interest Research Group, the New York City Bar Association, as well as a few legislators, such as Senator Jen Metzger and Assemblymembers Richard Gottfried and Carrie Woerner. What remains unclear is whether the leaders of both legislative chambers will support the proposal. Requests for comment to Assembly Speaker Carl Heastie’s and Senate Majority Leader Andrea Stewart-Cousins’ offices went unanswered. Note - this article has been updated to clarify that Seth Agata was appointed by JCOPE commissioners, not the governor. It has also been updated to include public statements made by JCOPE chair Michael Rosen about why the agency does not comment on investigations. In a complicated confluence of relationships, Cuomo’s government office notified the press about the events and streamed the governor’s appearances at rallies organized by the group; while his reelection campaign spokesperson served in that role for MCCEJ. Cuomo’s office and the MCCEJ at times appeared to be one. After the state budget agreement reached at the start of April included the $15 wage phase-in, the campaign celebrated success and closed up shop. Later in the legislative session, in June, Cuomo created and won passage of a package of reforms that define new restrictions on coordination among candidate campaigns, former government employees, and Super PACs; and stricter reporting requirements of donors to Super PACs. Another aspect of the legislation, which Cuomo signed into law on Wednesday, requires more reporting of donors to nonprofit advocacy groups and reporting of some of their previously private communications. Cuomo calls the bill an historic stand against dark money, the influence of Super PACs, and the Supreme Court’s Citizens United decision that opened up the floodgates for major, secretive political donations. On the other hand, many reform advocates believe the bill is both a strange mix of regulations and ones that do very little to address areas where there has been real corruption in New York, namely among state legislators. Robert Perry, legislative director of the New York Civil Liberties Union, says Cuomo has pushed through a confusing bag of proposals and that the way it was presented belies the ways in which the bill will impact small issue-based nonprofits. Perry points out that the bill is further confusing because the areas of law regarding political spending by groups like Super PACs and nonprofit advocacy groups are completely separate and yet the bill puts them side by side. In Cuomo’s not-too-distant past, he aligned himself with a nonprofit formed by business interests to advocate for his agenda, the Committee to Save New York. Like Mayor Bill de Blasio’s more recent Campaign for One New York, Cuomo’s group was shut down amid criticism and controversy. The new regulations would apply to these types of groups in terms of donor disclosure. Cuomo’s group did not disclose its donors; de Blasio’s group did so voluntarily. The Committee to Save New York was not the subject of federal investigation whereas the Campaign for One New York is as authorities probe whether government favors were promised or delivered in exchange for donations to the nonprofit. Critics have said that the Mario Cuomo Campaign for Economic Justice, like de Blasio’s Campaign for One New York, created a shadow government apparatus, in this case where government employees did work for lobbying groups and consultants were paid for their efforts by the MCCEJ while also representing Cuomo’s campaign. Cuomo appeared to criticize de Blasio’s relationship with the Campaign for One New York while unveiling his reform plan in June. “The collusion, the coordination, the subterfuge, the fraud in the current political system is rampant,” Cuomo said, according to The Observer, without naming de Blasio’s group. When speaking with reporters after the event, Gotham Gazette twice asked the governor for examples of the types of groups he was targeting, but Cuomo declined to name any, saying that he did not want to accuse anyone of illegality at that time. The new restrictions on coordination would have no impact on the MCCEJ or even the Campaign for One New York - both are nonprofit 501(c)(4) advocacy groups and thus only subject to the additional donor transparency requirements. Political action committees, or PACs, are tied to candidates, while independent expenditure campaigns, commonly referred to as Super PACs, are not allowed to coordinate with candidate campaigns. Both operate during elections to influence their outcomes - those groups register and report their fundraising to the Board of Elections. New restrictions on coordination and additional reporting requirements will apply to Super PACs. 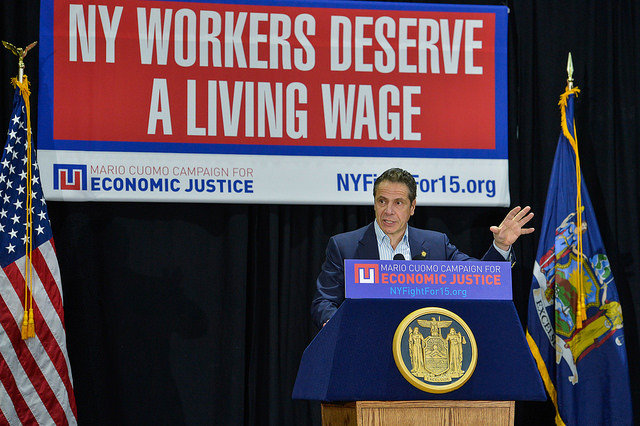 “The members of 1199SEIU have been proud to be a part of raising the minimum wage to $15 for nearly three million working New Yorkers, and passing the strongest paid family leave law in the nation. We hope that similar efforts are successful throughout the country, so that working people can provide a better future for their families and we can rebuild the middle-class.” said Mark Riley, press secretary for 1199SEIU, in a statement. The union declined to make its president, George Gresham, who served as chair of the MCCEJ, available to discuss how the campaign was coordinated. Sources close to the Mario Cuomo Campaign for Economic Justice told Gotham Gazette that the new rules on nonprofit donor disclosure would have had no impact on the MCCEJ as they lower the thresholds for nonprofits to report donors, but donations to the MCCEJ were already covered by the old lobbying law. Now, more disclosure is required of smaller donors after nonprofits spend smaller amounts of total money on lobbying. The MCCEJ’s donations appear to mostly have come in large sums. But, it will be impossible to know until the MCCEJ’s final disclosure documents are made public by the state regulatory agency they must report to: JCOPE, the Joint Committee on Public Ethics. So far, all of the reported donations to MCCEJ far exceed the new reporting requirements and therefore were covered by the old law. The SEIU Labor Management Initiative donated $637,781 in February and then gave the same amount again in April; Service Employees International gave $212,594 in January; in March, RWDSU Realty Group donated $63,778 in March; The New York Hotel and Motel Trades Council gave $85,038; and the SEIU1199 New York State Political Action Fund gave $85,038. New York’s previous lobbying act requires nonprofits that fit under the 501(C)(4) designation of the IRS tax code to disclose donations of over $5,000 and the personal information of those who make such donations if the group has spent more than $50,000 on lobbying in a calendar year. The new bill sets the total lobbying disclosure threshold at $15,000, while requiring disclosure of donations of more than $2,500, as well as those donors’ personal information. The MCCEJ is expected to have spent around $2 million from January to July. Sources told Gotham Gazette that MCCEJ disclosed its donors to JCOPE in July but the filing has yet to be made public. Most MCCEJ activity occurred in the early months of 2016 when Cuomo and company traveled the state on the $15 minimum wage campaign. The group’s final filing should be available in September. The new law also requires 501(C)(4) groups to disclose to the Attorney General any communications, whether written, broadcast or otherwise, having to do with legislation, votes on legislation, pending legislation, government action on rules, regulations or the decisions of any legislative or executive administrative body. A number of issue-focused nonprofits, some that lobby and some that do not, are opposed to the new rules because, unlike the MCCEJ, they do not enjoy a close relationship with the Cuomo administration or other parts of state government. The MCCEJ would likely have been subject to and impacted by this communication disclosure rule, but the group existed in that fairly unique position - its communications were already likely privy to the Cuomo administration and its donors were not likely to ever fear political reprisal for their support of the group’s lobbying efforts. “The problem becomes when the law applies to groups that are not sponsored and created by the chief executive of the state,” said Perry. Mike Durant, New York State director of the National Federation of Independent Business, a group that lobbied against the minimum wage hike said he found it quite challenging to go up against the combination of Cuomo and well-funded labor groups. Durant’s organization, a national nonprofit, is still reviewing what, if any, impact the new regulations will have on it. Doug Kellogg of Reclaim New York, a group focused on government transparency that has been critical of Cuomo in general and this legislation specifically, said that it's almost impossible to gauge how groups will be impacted because it is still uncertain how JCOPE will administer the law. JCOPE approved a set of regulations having to do with the law earlier this month. Many groups are anxiously waiting to see how the new regulations are actually enforced. Perry of NYCLU and a host of good government groups including Citizens Union, the New York Public Interest Research Group, and Common Cause New York say that the governor has given no evidence that these new disclosure rules for nonprofits will do anything to impact corruption. They say unlike the convictions of Dean Skelos and Sheldon Silver and the dozens of other legislators who have been removed from their seats, a trend that demonstrates a corruption epidemic in the Legislature, there is no indicator that nonprofits need more regulation. Asked whether Cuomo had evidence there was corruption or malfeasance among these groups, Cuomo spokesperson Dani Lever forwarded a Times Union article titled “Who Funds New York’s Good Government Groups?” The article says that some groups are not always forthright about their donors, but that on the whole most are; while also noting that at times a group has released a report related to a donor with a particular interest. A lawsuit challenging the bill is expected in the coming months - the suit will likely argue the law is an overreach and violates the First Amendment. Lever did not respond to a question regarding whether Cuomo is concerned about the blurring of the lines between government and nonprofit lobbying as in the case of the Campaign for One New York and the Mario Cuomo Campaign for Economic Justice. Note: Gotham Gazette is an independent publication of Citizens Union Foundation, sister organization fo Citizens Union. That all ended last year when Silver was indicted by the U.S. Attorney on multiple corruption charges and voted out of leadership. For a few weeks he sat at a desk like a rank-and-file member of the chamber he once dominated. Even then some legislators thought there was a chance Silver would survive the scandal, but that was until he was convicted on all counts in late November. On Tuesday, Judge Valerie Caproni reminded Silver of the finality of his conviction, sentencing him to 12 years in prison, ordering him to pay back more than $5 million in ill-gotten riches, and fining him $1.75 million. As tough as Silver’s sentence might seem, there are a number of reformers that fear it is just another in a parade of sentences handed out to state legislators who violate the public trust and that without real reform politicians will be able to continue using their power to earn outside income that is tied to policy decisions, that they’ll be able to steer state funding to those they do business with. Blair Horner of The New York Public Interest Research Group (NYPIRG) told reporters at a press conference a little more than an hour before Silver’s sentencing that he feared Gov. Andrew Cuomo and legislators will be content to act on only one reform measure this year: the first vote of two that is required to change the constitution so that lawmakers convicted of a felony are stripped of their state pensions. Both Silver and former Senate President Dean Skelos, also convicted late last year of public corruption, are set to receive hefty pensions. “If that’s all they did they might as well not do anything,” said Horner. “You would think that going to prison would be a far more scary prospect than a loss of pension,” Horner said, noting that prison terms have not yet proven to be a real deterrent. 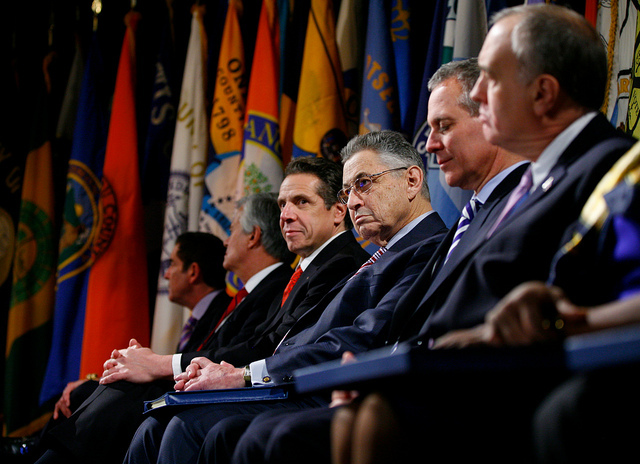 Silver is joining a long list of former New York legislators to serve prison time. 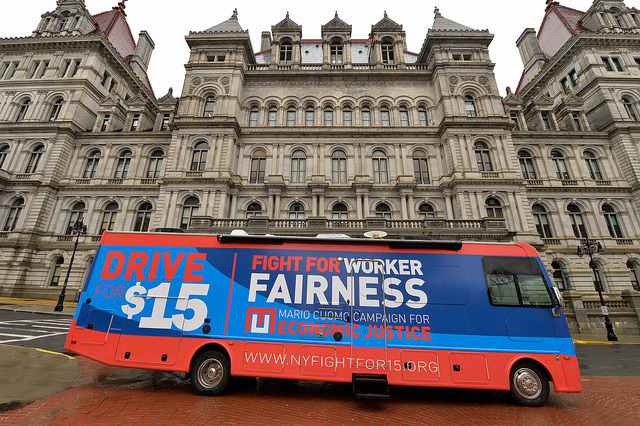 NYPIRG and other government reform groups including Common Cause NY, Citizens Union, League of Women Voters NYS, and Reinvent Albany held simultaneous news conferences in Albany and New York City on Tuesday to call on lawmakers to act to prevent corruption in state government. They released a list of five reforms they want to see enacted immediately. Good government leaders and reform-minded legislators say that the Legislature needs to take action to focus on preventing crimes instead of worrying about how to punish legislators once they have already been committed. 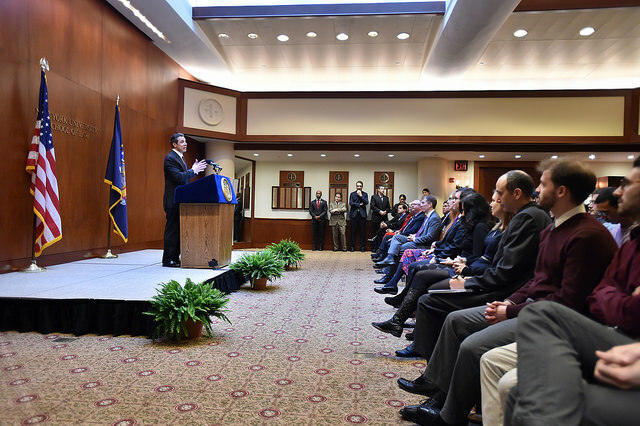 On Tuesday, Democratic Senator Todd Kaminsky was sworn in after winning the special election to replace Skelos. Asked by reporters if he thought there would be any consequences to the recent ethics scandals, Kaminsky said he thought his election was one direct consequence. Silver’s replacement, current Assembly Speaker Carl Heastie, struck a somber tone with reporters, but said that it was time for life to go on and that most state legislators are good, hard-working people, though there are always a few bad apples in every industry. Gov. Andrew Cuomo’s 2016 budget proposal included a bill that would restrict lawmakers outside income to 15 percent of their legislative salaries, which are currently $79,500 per year, mirroring the Congressional model. Silver was convicted of receiving payments from a law firm for which the only service he provided was referring sufferers of a deadly form of cancer. Silver steered state funding to a doctor who in turn provided Silver’s law firm with the name of Mesothelioma patients. The arrangement earned Silver over $3 million in referral fees. A number of other legislators work or have worked as counsel to law firms that may have business pending before the state, others have worked as lobbyists or consultants. Backers of Cuomo’s plan and ones like it say that legislators’ first loyalty should be to the people of New York and not to an outside employer. However, legislators complain that their annual salary is not adequate. A pay commission is currently considering raises for the Legislature and the executive branch. The Assembly has advanced its own bill to limit legislators’ outside income to almost $70,000 annually, a number that represents about 90 percent of current legislative salaries. In a new report, Comptroller Thomas DiNapoli criticizes this year’s budget for relying on lump sum appropriations. Silver was able to tap into hundreds of thousands of dollars of those sums to provide support for the doctor who provided him with referrals. The funds are not subject to public scrutiny. Good government groups want such lump sums either banned or included in a newly created database to track exactly who requests the cash, who ends up spending it, and how it is spent. A Citizens Union report recently revealed that the 2016-2017 budget contains $2.4 billion in lump-sum spending. Entities with business before the state are also some of the biggest campaign contributors. Good government groups say it creates at the very least an appearance of an inherent conflict of interest wherein those who give the most end up with favorable legislation, state contracts, and business subsidies. 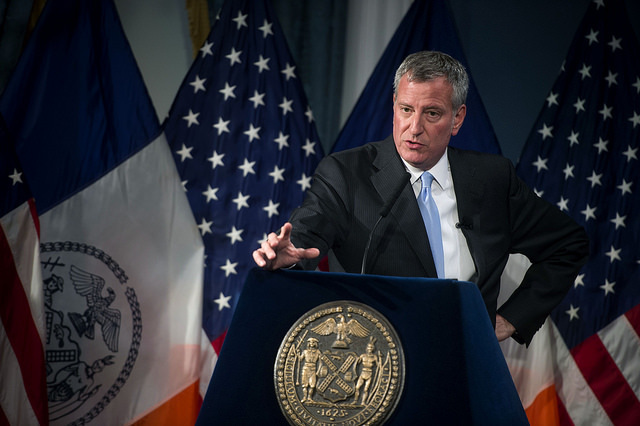 New York City currently places very strict limits on campaign donations from anyone with business before the city as part of its public-matching program, which the state does not have. In another part of his scheme, Silver encouraged real estate groups with business before the state to use a law firm he was connected to in exchange for kickbacks from the firm. Real estate interests are some of the biggest donors in the state and have been allowed to negotiate policy by Gov. Cuomo and the Legislature. Real estate and other groups have been able to game the state’s already lax campaign finance limits by using a loophole that allows the creation of mysterious limited liability corporations with the express purpose of donating to favored politicians. “We have the highest limits in the country of any state that has any and even those limits get circumvented,” said Horner. Leonard Litwin - who had previously been the largest campaign donor in the state - described to prosecutors how he and his corporation, Glenwood Management Inc., used the system to get around contribution limits. Richard Runes, a lobbyist overseeing Glenwood’s government relations, detailed the process during Silver’s trial, saying: “I would take the checks, and I would attach my business card to the check with a paper clip, put it in a 1200 Union Turnpike envelope, and deliver it to whichever campaign committee it was going to,” referring to Glenwood’s address. The Joint Commission on Public Ethics (JCOPE), tasked with policing lobbying and ethics in the state, is renowned for its opaqueness and lack of major action. The body is made up of legislative and gubernatorial appointees, and the three chairs it has had in its short existence have all served as aides to Gov. Cuomo (one of them even returned to Cuomo’s direct employment after leaving the body). The commission has routinely been crippled by infighting, with legislative appointees calling for less influence from the governor’s office, and JCOPE largely conducts its business in secret. The appointees of both Silver and Skelos have lingered on after their bosses were convicted of public corruption. Note: this article has been updated to reflect the two Tuesday news conferences and that a list of reforms was put forth. In a major departure from his predecessor, Assembly Speaker Carl Heastie publicly laid out his conference's proposals for government ethics reform during a wide-ranging speech and interview Friday morning. At a breakfast event hosted by Crain's New York Business, Heastie explained the proposals for preventing government corruption that will be contained in the Assembly's one-house budget, the release of which is key to intensifying negotiations with Governor Andrew Cuomo and Senate Majority Leader John Flanagan. The announcement comes after many weeks of silence from the Legislature and Gov. Cuomo on ethics reform despite the fact that the leaders of both legislative houses were indicted and convicted on multiple federal counts of corruption last year. 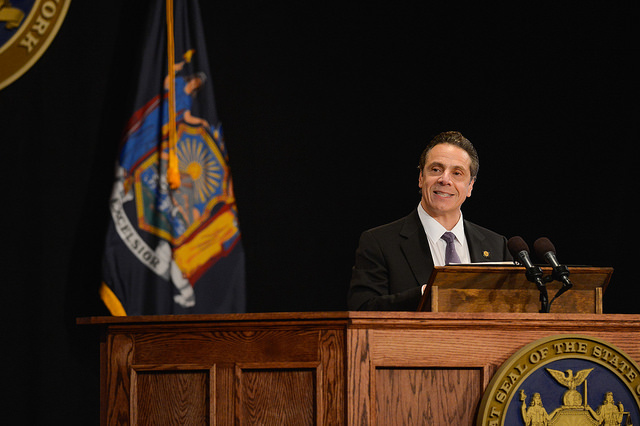 The proposals largely align with what Cuomo, a Democrat, outlined during his January State of the State address, while two of the policies are likely to face major push back from the Republican Senate majority. Heastie leads the Democratic Assembly majority. Two Assembly proposals likely to face opposition from the Senate deal with outside income legislators are allowed to earn. One takes direct aim at an issue that fell Heastie's predecessor, Sheldon Silver: The Assembly would limit attorneys to only making money for casework they perform, rather than from being "of counsel" and simply lending their name to a law firm. The second would prevent legislators from earning more in outside income than they receive in legislative salary. Legislators currently make $79,500 per year, though a compensation commission has recently begun examining the issue and is likely to recommend significant raises for lawmakers, who have not seen a raise in 16 years. Other measures Heastie outlined include closing the LLC Loophole that allows wealthy donors to subvert the state's campaign contribution limits, tightening rules around the use of campaign funds and party "housekeeping" accounts, which are also used to get around state campaign finance laws. Unlike anything Silver ever did, Heastie described the Assembly's one-house budget and then took questions from two reporters for 45 minutes in front of a crowd of more than 200 in a Manhattan club ballroom. Heastie followed that Q&A by taking questions from other journalists in attendance for about 10 minutes. A significant portion of the dialogue centered around government ethics and corruption, with Heastie both outlining new reform plans and defending himself and his colleagues as good public servants. After Heastie made his opening remarks, Crain's editor Erik Engquist and Politico New York reporter Laura Nahmias asked the speaker a wide variety of questions, including several that pushed Heastie for his take on what actually plays into corruption in Albany. Confronted with a recent poll that found 90 percent of voters think Albany has a corruption problem, Heastie defended his members. "I don't want to ignore fact that there's been issues amongst elected officials, but I do believe the majority of elected officials go there for the right reasons," said Heastie, adding that "in any industry you are going to have bad apples." Heastie also continually referred to things that "tripped up" his fellow legislators - apparent references to the rash of high-profile corruption cases Albany has seen over the last decade. He challenged the media to cover "the good things" the Legislature does and also praised prosecutors for doing their jobs. Heastie pushed back against the assertion that campaign contributions can lead to corruption and half-joked that the only way for politicians to win is to only accept donations from groups they don't support because the press points out donations to politicians when they coincide with legislation that is favorable to a donor. "Leveraging your name is something that got my predecessor in trouble," Heastie said, pointing to the "of counsel" measure contained in the Assembly budget. Asked later how the bill would actually be enforced Heastie replied that the conference hadn't actually gotten that far, but said the Joint Commission on Public Ethics (JCOPE) is a possibility. "We have a significant number of lawyers in the conference and people are comfortable with what we've put forward," said Heastie. Gov. Cuomo's budget contains a number of ethics proposals, including one that would limit legislators' outside income to 15 percent of their government salary. The budget also includes an end to the LLC loophole, pension forfeiture for legislators convicted of abusing their office, and increased transparency measures. Cuomo, however, has been focused on stumping for his $15 minimum wage plan, only discussing ethics reforms when questioned by the press. Asked if ethics reforms were likely to stay in the budget late last month Cuomo responded: "Well, we're going to see. I would like to get it done in the budget, I made it as part of the budget. And I think that everyone understands that you need reforms in Albany. I proposed very drastic reforms — primarily for the Legislature, which is where we've seen a lot of corruption recently. Limiting outside income, passing pension forfeiture, more disclosure, more transparency, closing the LLC loophole. I stated it very clearly in my State of the State. It's part of the budget. And as we get closer and actually have budget conversations, it's going to be at the top of the list." The governor's office did not respond to a request for comment on the Assembly Democrats' ethics plans. When Gotham Gazette asked Heastie if he had any sense of what Senate Majority Leader Flanagan might think of the proposals, he said to ask Flanagan. Flanagan's office did not respond to a Gotham Gazette request for reaction to Heastie's announcement of the Assembly's budget-based ethics reforms. Heastie told Gotham Gazette that no "detailed" budget discussions have taken place yet because neither house has fully issued its one-house budget proposals. "There hasn't been any real discussion except overall of what we think we need to see happen through the budget," said Heastie. A budget deal is due by April 1, when the next fiscal year begins. If ethics reforms are not accomplished in a budget package, they could be hashed out in the legislative session to follow, though there is reason to be skeptical that significant reform would be agreed upon between April and the end of session in June. Meanwhile, Assembly Democrats have faced major criticism from the Republican minority for a drawn out rules reform process whereby the chamber will change its practices in an effort to become more democratic. 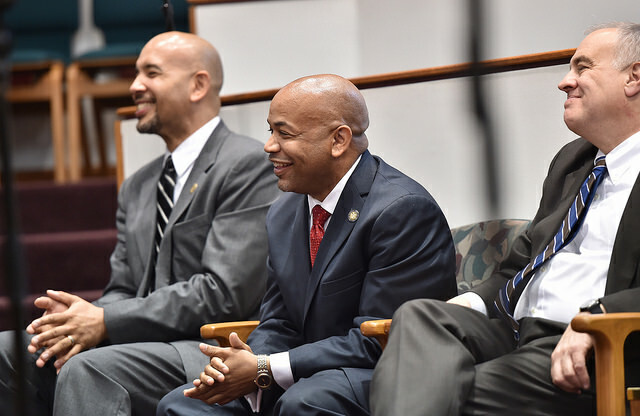 Last year, after replacing Silver, Heastie put together a commission to look at altering the rules of the chamber to increase transparency and participation. That group has had almost a year to work on the issue and has held no public hearings. The group's two chairs have given Gotham Gazette and other media outlets conflicting timelines for the release of what they said is a 49-point reform plan. On Friday, Heastie told Gotham Gazette, as the chairs have in the past, that the reforms should be released soon. "They're being brought out in three different forms," Heastie told Gotham Gazette. "Some we can draft up in rules, some I can do administratively, and then there's some technology things. We'll probably put things out in the next week or so." Former Assembly Speaker Sheldon Silver, thought to be the most powerful man in New York state government for decades, was found guilty Monday on seven counts of corruption in multiple schemes to monetize the power of his office. During the trial Silver's own defense attorney insisted that Albany itself was on trial and claimed that Silver's behavior was business as usual in Albany, and that even if it felt unseemly, it was in fact legal. The jury did not agree. And though Silver left the courthouse saying he plans to continue his legal fight, the big question now is whether this startling development will be the impetus for major reform of the rules of the game for Albany lawmakers. With his conviction, Silver is removed from office and becomes the 32nd state lawmaker forced from office due to criminal or ethical issues since 2000. Silver never took the stand on his own behalf and the defense called no witnesses. Instead, Silver's defense attorney, Steven Molo, argued that the federal government was trying to make Albany's long tradition of backroom dealing illegal. "It makes some people uncomfortable, but that is the system New York state has chosen, and it is not a crime," Molo said on Nov. 3 during opening statements. "The prosecutors are trying to make it a crime, but it's not." Some advocates and legislators have railed against Silver's influence for years, decrying the concentration of power of the 'three men in a room,' of which Silver was one until he was indicted and resigned his leadership post. Some thought that with Silver all but gone Albany would somehow be redeemed. That redemption has been elusive. 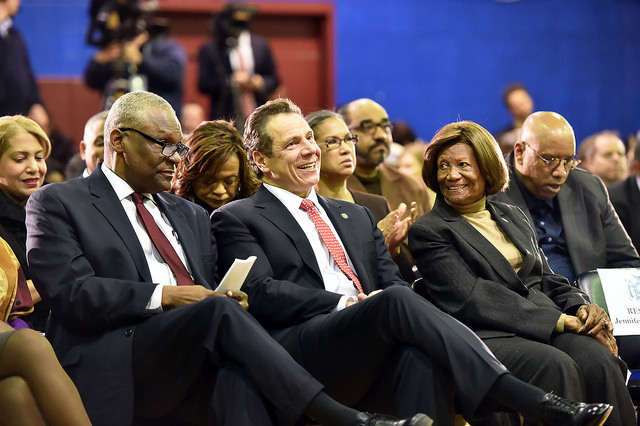 As Silver faces decades of prison sentencing, Albany is still left to write its own rules. The men in charge, including Gov. Andrew Cuomo and Assembly Speaker Carl Heastie, who replaced Silver, have indicated there is currently no appetite for more reform and have rejected calls for special session on ethics. "We will continue to work to root out corruption and demand more of elected officials when it comes to ethical conduct," Heastie said in a statement responding to Silver's conviction, adding that "accountability and transparency" are of utmost importance to the Assembly Majority. Heastie went on to list previously enacted reforms as evidence of his commitment as well as reform efforts that have been repeatedly stalled in the legislature by Senate Republicans. "In addition to the enacted measures, the Assembly Majority has independently passed a number of ethics-related bills that were not taken up by the State Senate," reads the statement from Heastie, a Democrat like Silver and Cuomo. "Among these measures is a bill to close the LLC loophole and campaign finance reform measures to limit the influence of big money in politics, including the clarification of housekeeping accounts and independent expenditures, as well as the establishment of a meaningful public financing system." Advocates hope public reaction to the conviction and the ongoing trial against Silver's former Senate counterpart, Sen. Dean Skelos - which is creating sensational soundbites thanks to wiretaps - will force more systemic change. Charges against Silver and Skelos were brought by U.S. Attorney Preet Bharara's office. 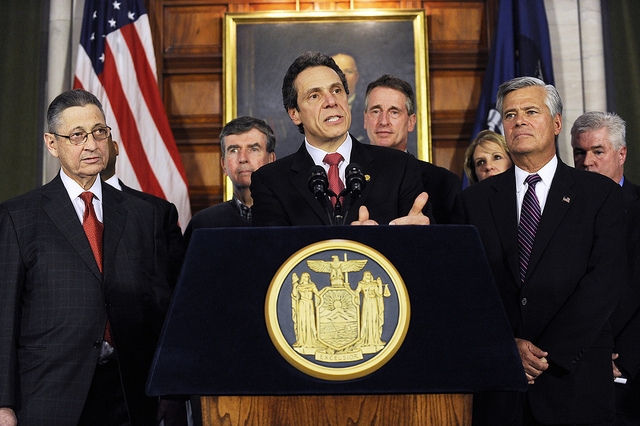 "A political earthquake has hit Albany," said Blair Horner of The New York Public Interest Research Group. "This is a stinging rebuke to the 'Albany business as usual' defense and a clarion call to clean up state ethics. Hopefully this will be the tipping point at which New York's political leadership will gets its heads out of the sand. Governor Cuomo must now call a special session devoted to ethics reform." Good government group Citizens Union, which tracks lawmakers who've left office due to criminal or ethical issues, quickly issued a statement calling for a special session after Silver's conviction. "Citizens Union calls upon the legislature to meet in special session and deal once and for all with the problem of public corruption in state government," the statement reads. "Legislators need to address the problem of using their public posts for private gain." Attorney General Eric Schneiderman has been calling for a move away from incremental reform and laid out a legislative package to move the needle and prevent conflicts of interest and corruption. Increased legislative compensation, but add greater limits on outside income. "Limit the influence of dark money campaign contributions and end government spending that takes place in the shadows' through measures such as closing the infamous LLC loophole." "Reform ethics oversight and enforcement" by making changes to JCOPE's structure, scope, and voting procedures to increase transparency and independence. Earlier this year, Gov. Cuomo pointed to prior reforms he oversaw that required disclosure of outside income that enabled the case against Silver. "We've passed disclosure laws that, frankly, would have been unthinkable ten years ago," Cuomo said, adding, "For the first time ever, they have to disclose their clients. That's one of the reasons this case is this case, right?" But the Reform Albany Act that contained the disclosure requirements also created the Joint Commission on Public Ethics, a board that has yet to take any major actions and remains paralyzed by infighting between members appointed by legislative leaders (including Skelos and Silver) and Cuomo. In response to the Silver verdict Monday, Cuomo issued a statement that read, "Today, justice was served. Corruption was discovered, investigated, and prosecuted, and the jury has spoken. With the allegations proven, it is time for the Legislature to take seriously the need for reform. 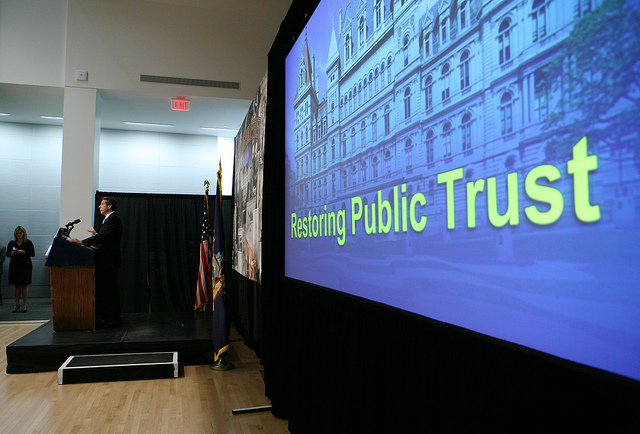 There will be zero tolerance for the violation of the public trust in New York." There is some indication rank-and-file legislators are looking for larger reforms. Assembly Member Daniel O'Donnell issued a statement calling for a full-time legislature to limit the influence of outside income and to raise legislative salaries in conjunction. "We need to change the way things work in Albany. 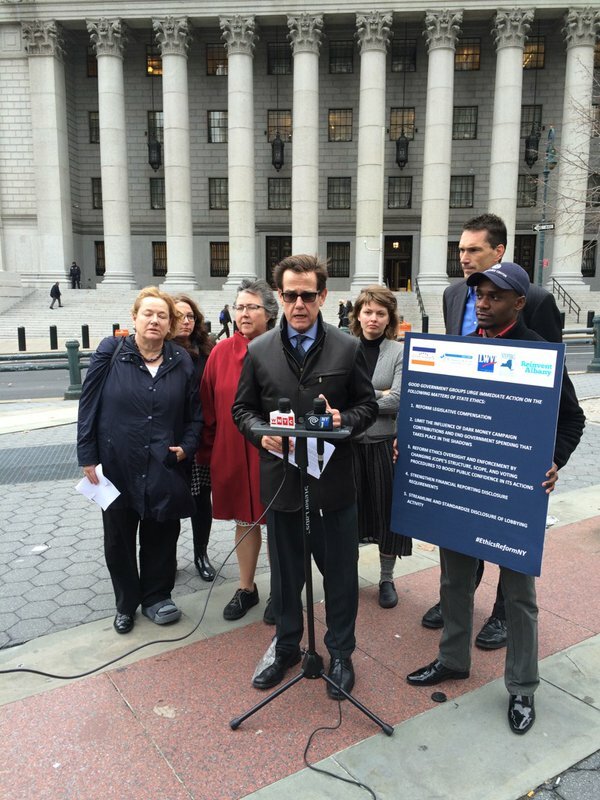 As today's verdict demonstrates, the ability to earn outside income creates too much potential for impropriety," wrote O'Donnell, a Manhattan Democrat. "To restore respect for the hard work that the New York State Legislature does, we need to make it more like the federal system." Schneiderman, a Democrat, has called for the creation of a full-time legislature and a few members of the Senate also support the idea. Several other members of the Assembly and Senate have called for major changes to campaign finance and other laws. Paul Newell, a Manhattan Democratic district leader who challenged Silver in 2008 and is raising money to run for Silver's seat, called on voters to take action to reform state government. "This is a sad day for Lower Manhattan and a sad day for New York," Newell said in a statement. "Today's verdict proves it is up to us to reclaim our government. 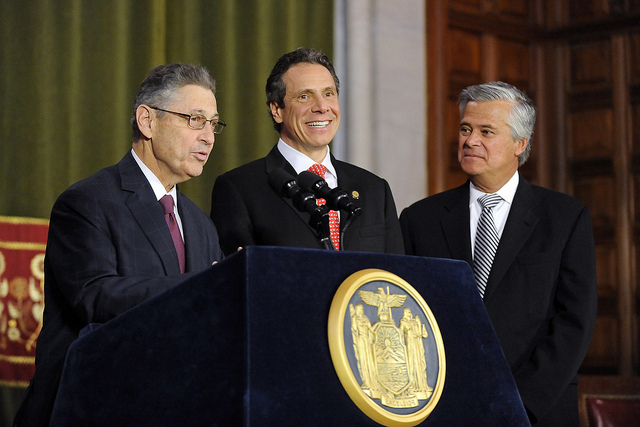 No court will end Albany's culture of corruption and cronyism. If we, as voters and citizens, continue to accept a government that favors those who buy power and influence, then that will be the government we get. But, if we want a government that is fair, transparent, and works for all of us, we must reclaim it ourselves. We can and must do better. The time for us to act is now."